In March 2019, we at Erichsen’s Auto, Inc. Will are celebrating our 42nd year family business anniversary by joining the computer age, and bringing our business to the web. Since his first repair in his parents driveway in 1977, to the building of their current repair facilities on Route 299 in Highland NY 12528. Jerry Erichsen Sr. has worked hand in hand with his wife Donna to make Erichsen’s Auto a respected, and thriving business in their community. Jerry and Donna soon learned that providing a 24 hour full-service light and heavy-duty repair and towing company is no easy task, and with the birth of their first child, a son in 1985, a family owned and operated business was born. In 2004, Jerry Jr. assumed the responsibilities of Towing Manager to oversee the day to day towing operations of Erichsen’s Towing, and he became our Heavy Rotator operator and All heavy commercial towing services and road side needs. Although only 18 years old, Jerry Jr. proved his knowledge by leading our company through the expansion of its AAA Facility & Towing programs; as well as providing roadside assistance to the highways thousands of yearly patrons. While Jerry Sr. and Jr. keep a watchful eye over daily activities at their repair and towing facilities, Donna ensures the office, the heartbeat of their business is always pumping also with help from their daughter Victoria Erichsen's dispatching and following in her moms foot steps. 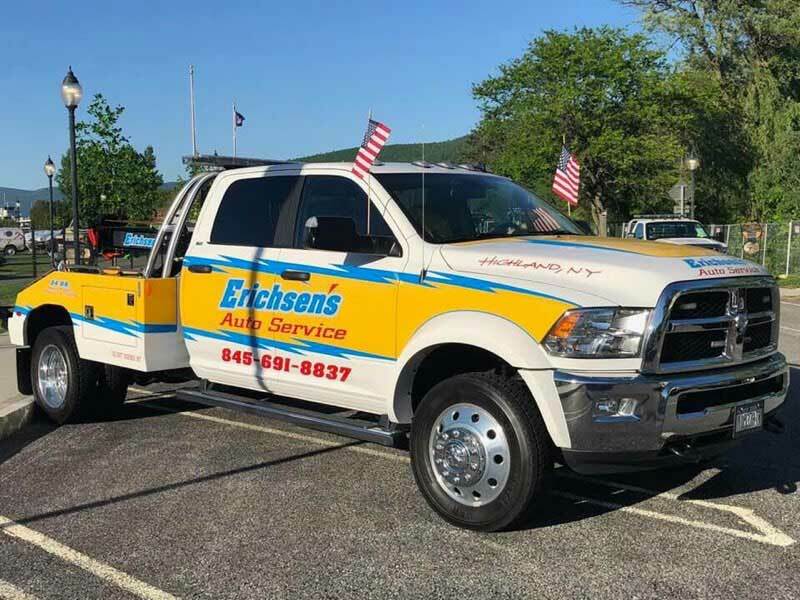 Erichsen’s Auto and towing ensures every customer feels like family and receives the highest level of quality and service. Feel free to browse what our entire website has to offer, or we invite you to come on in, view our services and visit our facilities.